Well in this case, it’s in Chicago next week. A Death Café is an informal, non-therapeutic gathering of people who want to discuss their experiences grieving. Death, as we know, is a subject that can put a damper on most conversations. But here, it is the conversation. Therapy is great, whether individual or group. But that’s not what this is. Many people just need a chance to talk about what they’re going through: without judgment or diagnosis. And as it turns out, a lot of those people are men. Like it or not, men are still expected to be the “strong” ones when someone close to them dies. They’re expected to take care of others, get things done, hold it all in. But what I’ve found in my interviews is that men are not just willing but eager to talk about losing their friends. So on Tuesday, October 9, the first Death Café in Chicago will be held for men grieving their friends. 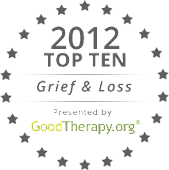 We hope this is the first of many (and not just for men), so that others have the opportunity to finally talk about a loss that is sometimes difficult to explain. When people hear it’s called “Death Café”, there’s also a second question: ‘what’s on the menu?’ Well, besides conversation, we’ll have coffee, tea, and goodies. Space is limited, so go to Events for more information. We look forward to seeing you on Tuesday. To learn more about hosting a Death Café in your community, click here.